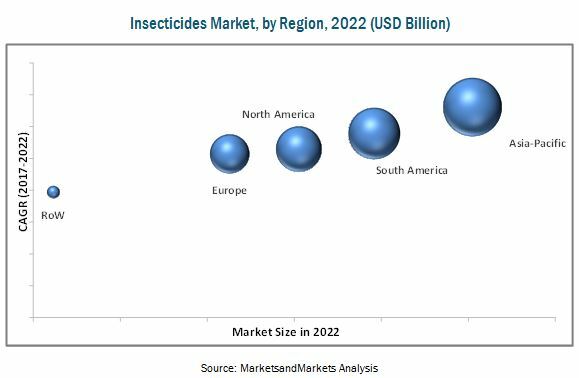 [173 Pages Report] The global insecticides market is estimated to be valued at USD 14.51 Billion in 2017 and projected to reach USD 19.27 Billion by 2022, at a CAGR of 5.8% from 2017 to 2022. Growth in the market can be attributed to factors such as fall in the per capita arable land, increasing crop losses due to insect attacks, and advancement in farming practices & techniques. The global insecticides market has been segmented on the basis of type, crop type, mode of application, and formulation. It has been further segmented on the basis of region into North America, Europe, Asia-Pacific, South America and the Rest of the World (RoW). The main objectives of the report are to define, segment, and project the market size of the global insecticides market with respect to the above-mentioned segmentations and provide a detailed study of key factors influencing the growth of the market, along with profiling the key players in the market and their core competencies. This report includes estimations of market sizes for value (USD million) with the base year as 2016, and forecast period from 2017 to 2022. 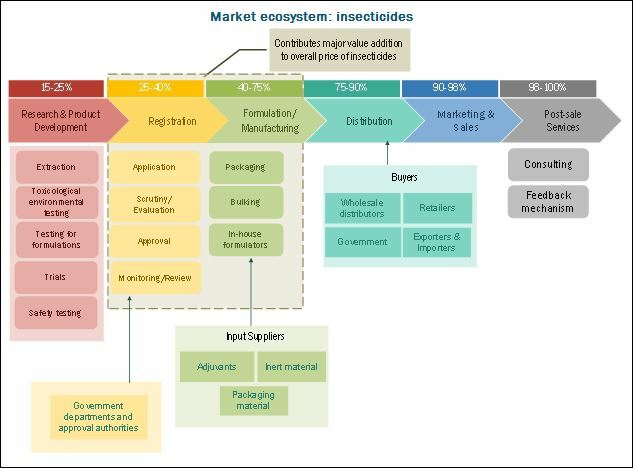 Top-down and bottom-up approaches have been used to estimate and validate the size of the insecticides market and to estimate the size of various other dependent submarkets. Key players in the market have been identified through secondary sources such as the U.S. Environmental Protection Agency (EPA) and the Food and Agriculture Organization (FAO), and their market share in respective regions has been determined through primary and secondary research. All percentage shares, splits, and breakdowns have been determined using secondary sources and were verified through primary sources. The insecticides market is projected to grow at a CAGR of 5.8% from 2017, to reach USD 19.27 Billion by 2022. The increasing global exports and rise in instances of crop losses due to insect infestation are resulting in an increased market for insecticides, globally. Insecticides are formulated to kill, harm, repel, or mitigate one or more species of insects and offer several advantages to producers. On the basis of type, the organophosphorus segment accounted for the largest market in the insecticides market in 2016. This type of insecticides is the most widely used as it is cheaper than other alternatives. The U.S. and U.K. contribute to a larger share for these insecticides, globally. On the basis of crop type, the cereals & grains segment accounted for the highest consumption of the insecticides in 2016. On a global level, the total cereal production has been increasing, and with the growth in cereal production and consumption, it has become important for producers to focus more on its yield and quality by using different insecticides. On the basis of formulation, the granules segment is projected to grow at a higher growth rate in the global insecticides market from 2017 to 2022. Granules are ready-to-use active ingredients which are mixed with water or other solvents. The Asia-Pacific region is projected to be the fastest-growing market for insecticides between 2016 and 2022. The Asia-Pacific market experiences the maximum consumption of insecticides due to the increasing awareness about pesticides and growing demand for crops. Key players focus on research & developments to develop products conforming to European regulations for insecticides, since these regulations are considered to be benchmarks in terms of certain insecticides. However, factors such as the harmful impact on human health and the uncertainty of the world economy affect the pesticides industry negatively, thereby restraining the growth of the insecticides market. Key players identified in the global insecticides market include BASF SE (Germany), Bayer CropScience Ag (Germany), Dow AgroSciences (The Dow Chemical Company) (U.S), ChemChina (Syngenta AG) (China), E.I du Pont de Nemours and Company (U.S.), which are among the key players of the insecticides market as these are well-established and financially stable players that have been operating in the industry for several years. Most key participants have been exploring new regions through expansions, investments, new product launches, and acquisitions across the globe to avail a competitive advantage through combined synergies. 14.9 Sumitomo Chemical Co., Ltd.
*Details on Business overview, Strength of product portfolio, Products offered, Business Strategy excellence, Recent developments, MnM view might not be captured in case of unlisted companies.